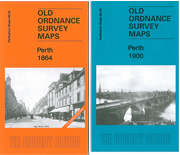 Covers Strathearn House, Morrison's Academy, West Church, Railway Station, Town Green and St Michael's Church. Covers General Railway Station, Barracks, St John's Church, Tibbermore, Pitheavlis Castle and Greyfriars Burial Ground. Covers Perth Bridge, General Railway Station, Barracks, Welshill Cemetery, St Stephen's Church, Bridgend and Dovecot Land. Special price for the pair.